City Tavern, a gastropub in Culver City, CA, had been getting positive attention on both UrbanSpoon and Yelp. It was time to confirm or deny the quality of the burgers at this spot. So far, our visits to Culver City had resulted in a series of burger-related disappointments. The Marinater and I hoped that City Tavern would reverse the trend or, at least, provide an outlier. Public parking was free in the nearby structure. We were seating immediately by the friendly and enthusiastic staff. The establishment offered a full bar. City Tavern also had beer taps at the tables. We ordered a CT Burger and a Brew Burger at $10 and $11, respectively. We passed on the fries, since the fries arrived frozen in bags on the Cisco Foods truck, and City Tavern still felt it was appropriate to charge $5 for fries. I did not feel it was appropriate to pay $5 for fries of that quality. The cheeseburgers arrived in about 10 minutes. 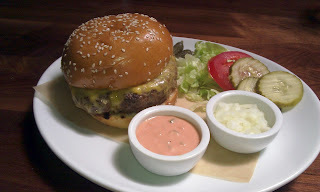 The Beef: City Tavern used Creekstone Farms, grass-fed, 100% Angus Chuck for the 8-ounce burger patties. The beef arrived pre-ground from Rocker Brothers Meats. The beef was bland to the point of tasting watery. The sole flavor that the Chuck yielded was a mild note of beefiness. The beef had a fat content of 20%, but in the case of the Brew Burger, there was under-cooked chorizo in the blend. The chorizo contained unpleasant chunks of raw pork fat. While we ordered the burgers cooked to Medium, they arrived dead Rare. The Rare Chuck was insipid, because almost none of the collagen melted. The texture of the beef was slick and raw. The beef was completely without character. The Seasoning: The exterior of the burger patties at City Tavern were dusted with only a very faint hint of salt. The seasoning was completely inadequate to compensate for the painfully bland beef. The Sear: The sear on the hand-formed, under-cooked patties was unremarkable, and it offered little in terms of improvement in either flavor or texture. The Preparation: The 8-ounce patties were hand-formed during morning prep. The burgers at City Tavern were under-cooked to a limp and watery Rare on a gas-fired grill. The burger patties were turned three times, and this was two times too many. The Cheese: The cheese on the CT Burger was bland, Tillamook Cheddar. It brought nothing to the party but fat. The cheese on the Brew Burger was the same bland Tillamook Cheddar, but this was Pub Cheese. This meant that City Tavern added IPA to the cheese. This resulted in a very bitter cheese, which lent an unpleasant undertone to every bite. 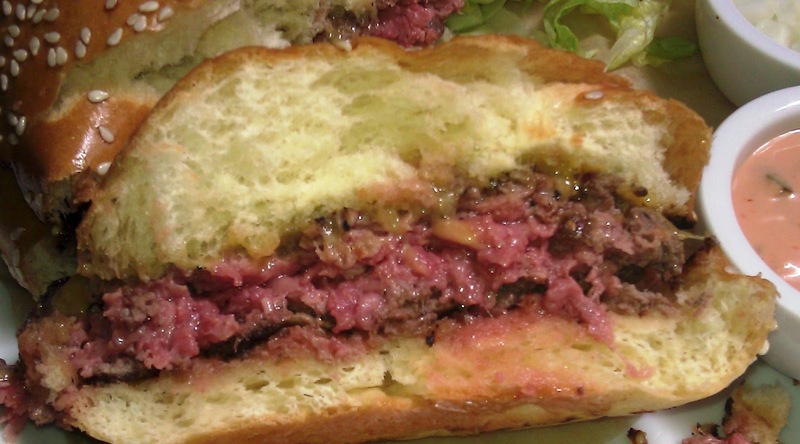 At first I thought that the burger was charred, but the sear was too weak. It took a few moments to determine that the culprit was the bitter Pub Cheese. 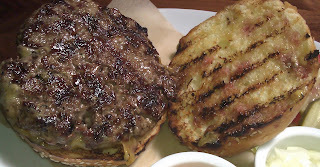 The Bun: The CT Burger arrived on a neutral, fresh, moist, seeded, burger bun. The Brew Burger was served on a mildly salty, pretzel bun. Both buns were sourced from Rockenwagner Bakery. Both buns were adequate, but not especially interesting. Both buns were grilled rather than properly toasted on a flat-top. The Meat To Bun Ratio: This was fine with both the CT Burger and the Brew Burger. The Toppings: The shredded Iceberg lettuce and tomato slice that accompanied the CT Burger at City Tavern were fresh and fine. 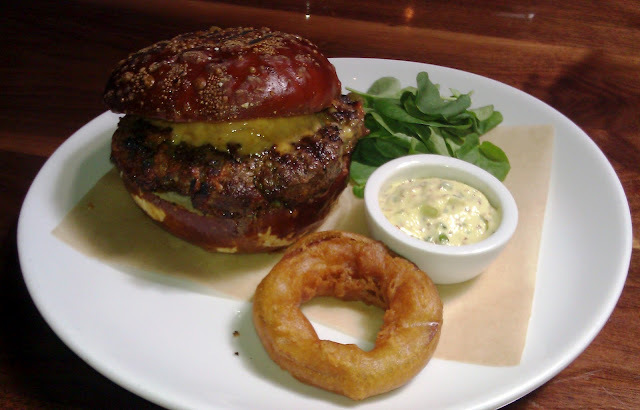 The watercress and onion ring, which were served with the Brew Burger were odd and awful, respectively. The watercress tasted very green, and this did not work with the chorizo-laden, bitter cheese-covered burger. The onion ring was a greasy, bland offense to the palate. It was bland, dense, hard, and incredibly oily. The Brew Burger was also served with an aoli, and I was grateful that I had this on the side. The aoli was, presumably a play on mustard, but it lacked acid and/or bite--it was yellow mayonnaise. The Value: Two burgers, and...that was it...just two burgers (no beverages or fries) with tax and tip came to just under $27 at City Tavern. The value was great for City Tavern. The value was exceptionally poor for the diner. City Tavern took quality ingredients and put them to waste via a combination of undercooking, mismatching flavors, and underseasoning. The prices were too high when compared to the flavors and quality of preparation. Burger Review : City Tavern is probably best visited for its fine selection of beers and cocktails. At the time of this review, the burgers could be safely avoided. Fries are terrible. But I thought the burger was a bit better than you did. Perhaps the couple of beers already in me accounts for the discrepancy. Hmmm. I was looking forward to trying this place out, now not so much.